There are many respiratory problems that can prove fatal if prompt action is not immediately taken to tackle them. These include sleep apnea, emphysema and asthma and this is where machines called oxygen concentrators are extremely useful. These machines separate oxygen from the room air and administer it to the person as a medical intervention. This is a treatment that can be utilized anywhere, either at home, in the hospital or nursing home or even when flying on an aircraft. The Invacare oxygen concentrator is such a device that delivers peace of mind to the patient, who does not need to worry about running out of oxygen in any situation or location, especially when out of home. It is a portable device used to provide oxygen therapy to a patient at substantially higher concentrations than the levels of ambient air, is small in size and more mobile. Invacare is one of the leading manufacturers of home-treatment products for long-term or incurable ailments or disabilities. The company offers a range of home-oxygen products, including the Invacare Perfecto 2V Oxygen Concentrator 5 Liter. 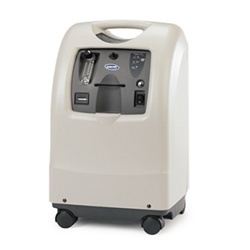 The Invacare Perfecto 2V is a user-friendly, easy to manage portable oxygen concentrator and is an affordable model added to the Invacare concentrator range. It is a quiet, lightweight concentrator that has a 5-liter per minute output capacity. The machine has a handle on the top that makes it easier to move it from one place to another and is also equipped with the Sens02 Oxygen Sensor that ensures that the oxygen outflow is tailored to meet the patient’s needs. The Perfecto 2V has the technical features that ensure that it is a safe, affordable and most convenient device to administer oxygen in a medical emergency situation. The Perfecto 2V does not have a time-based system, but is based on pressure which is better equipped to deliver the oxygen needs of patients, who need a specific dosage. The Invacare Perfecto 2V has systems for diagnostics and safety that give advance warning of any trouble with the machine and also identify the malfunctioning areas and reduce the time for repair. There is an alarm feature independent of the battery, to help patients know when trouble strikes. When the level of oxygen falls below a designated level, a low-flow alarm system warns the patient or the caregiver so that necessary action can be taken with due urgency. Those who due to illness or some disability need to have oxygen on a continuous basis have always felt handicapped by devices that limit any kind of movement and certainly make travel impossible. Existing products are usually heavy and cumbersome and make patients dependent on caregivers to enable any kind of normal life. The Invacare Perfecto 2V on the other hand enables those who need oxygen to live an active life, travel and have fun without being inhibited by the oxygen therapy that they need on a regular basis. A power-loss alarm that is battery-free. A Sieve-GARD monitors the oxygen concentrator’s sieve performance. A standard SensO2 oxygen sensor ensures oxygen output meets the dose requirement of the patient. A low flow alarm notifies the patient and caregiver if the oxygen flow is below a specified level prescribed for the patient. Comes standard with the SensO2 oxygen sensor for ease of maintenance. HomeFill compatible for inventory flexibility; works with IOH270 Ready Rack. Many common components are shared with the standard Perfecto2 and Platinum Home Oxygen Concentrators to provide easy replacement and maintenance. Our price: $705.00 "Please click here to get discount coupon for this item"